This week was supposed to be one of three peak weeks for me. The Hal Higdon Intermediate 2 plan called for 0-5-10-5-0-10-20, yep that's 50 miles (and yep, I started a plan for someone who has run multiple marathons). Actual was 0-6-6-6-0-10-18, yep that's my biggest weekly mileage ever on my way to my biggest monthly total ever. 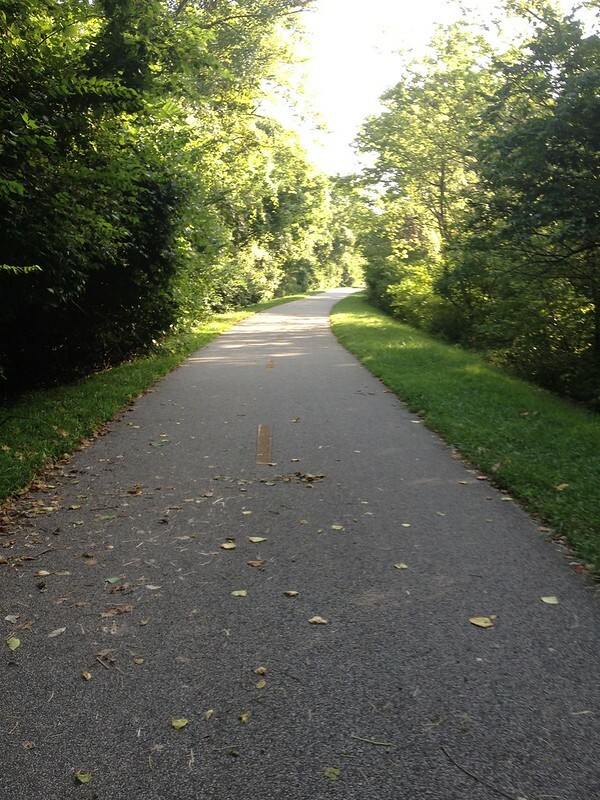 On top of that, it was very hot and humid this week with a heat advisory posted on several of the days, including my long runs. So, I kept good track of my hr, took along plenty of fluids and took routes where I could refill. Tuesday, Wednesday and Thursday I ran at night since I gave up on becoming a morning person after just one week of my current attempt (attempt three or four, maybe five). With Saturday and Sunday being the hottest days and being my longest runs, I sucked it up and got up early both days. Saturday I got up at 5:30 and was out the door at 6:15. It was 77 degrees and 93% humidity, so it didn't take long to be in a full sweat. I brought my normal 16 ounce frozen water bottle (the cheap ones you buy by the case) I hold in my hand and a 20 ounce waist belt water bottle (Camelback Delaney) with ice and Gatorade and set off. I was feeling good until about mile seven when I started a 3 mile stretch with no shade and temperatures already in the mid eighties (heat indices in the low nineties). I decided I would make a call on 15 or 18+ Miles when I got to the gas station I planned to refuel at (mile 11). There was a water station about a mile before the gas station and I stopped to cool off. I was already totally soaked, squishy shoes and all before I poured water over my head. Right there I decided to call it at 10 miles, called the SAG wagon (DW) and walked to the gas station. I didn't feel that bad but knew if I ran much more, I was going to hurt myself. I walked in the gas station and the attendant was like "wow! You are soaked all the way through". I felt bad I was dripping sweat everywhere, but bought two bottles of Gatorade and paid with dry money I keep in a ziplock bag. Then I went outside and waited for my ride. I actually didn't feel too bad the rest of the day, went on a lunch date, took a nap then grilled out. My view walking to my pick up point. 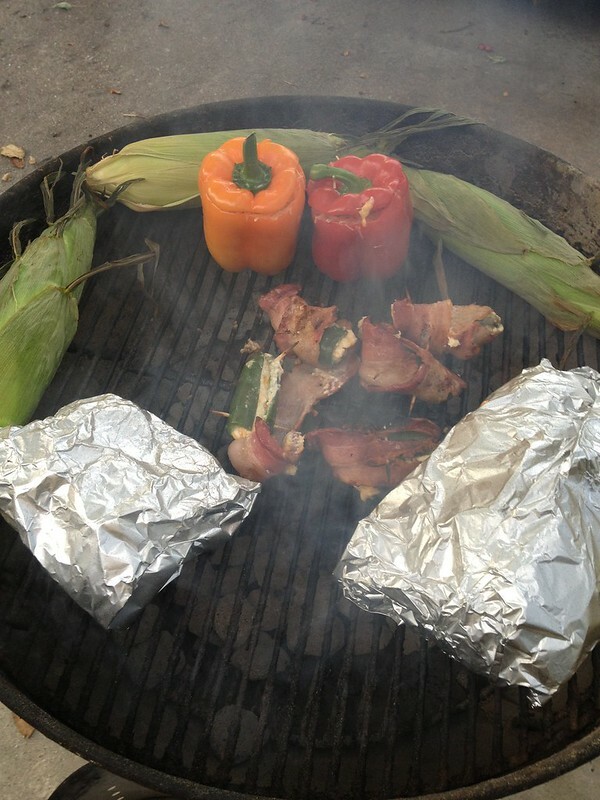 That evening I grilled some garlic (in foil), red potatoes (in foil), corn, peppers stuffed with black beans, black eyed peas and cheese. Oh, and I made some poppers for appetizers. Yum! 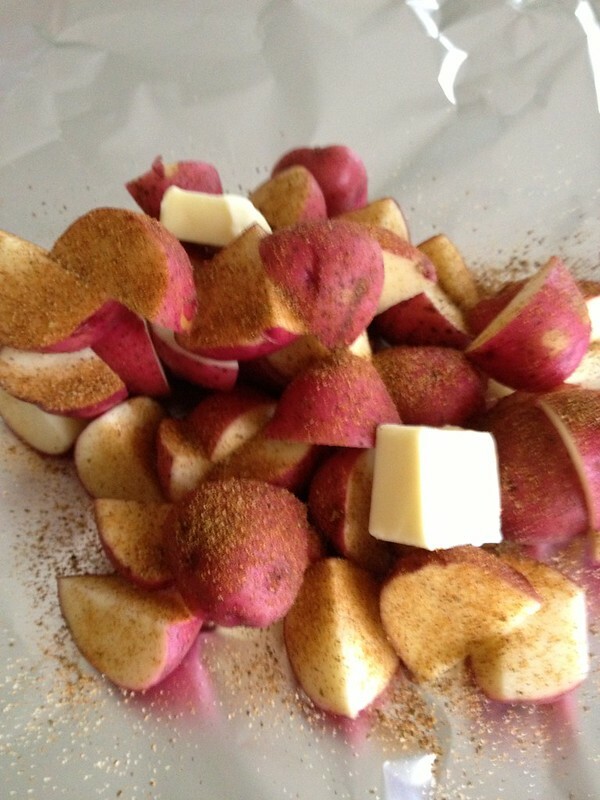 For the red potatoes, I diced them, put a bunch of Old Bay seasoning on them, and added to butter. Roast on medium heat for 45 minutes to an hour. Delicious! My son said they tasted like the red potatoes we eat in New Orleans. Along with the veggies, I grilled some BBQ chicken. 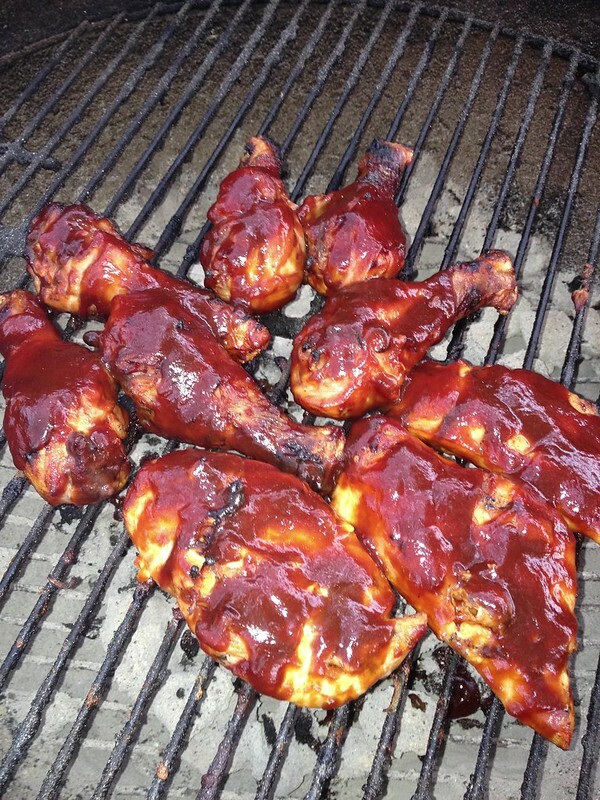 I used some Yuengling based BBQ sauce we picked up on vacation. Sunday I managed to get up at 5:15 am and be out the door by 5:45 am. Who is this guy? Morning person? Nahhhh :-). It was dark when I left the house, but light enough I got away without bringing a head lamp. Same route as Saturday, same plan. Getting to the three mile stretch with no shade a little earlier made all the difference. The sun hadn't burned all the way through the morning haze yet so it didn't feel like my skin was cooking. Made it to the gas station where the attendant said I looked just as soaked as yesterday. We chit chatted, I refueled and kept going. I took the 15 mile loop turn off instead of the 18 mile loop turn off figuring I could re-evaluate at mile 14 (a park 3/4 mile from my house). The park has a faucet with cold running water you can run on your head and I love stopping there to cool off. When I arrived at the park, I didn't feel horrible, so I cooled off and came up with a new plan. Run a mile out and back and cool off at mile 16 and re-evaluate, repeat at 18 and if I made it to 20, walk home. Mile 15-16 were getting even slower than my usual slow MAF pace, but I didn't feel too bad. At mile 17 my stomach started getting that dull, don't drink anymore feeling because I'm no longer thirsty, so I decided my 18 mile cool off would be my last and I walked home from there. By that time, the temp was in the upper 80's with heat index of 95 so probably a wise move. While walking somewhere during mile 15, a lady walking her dog asked me "how far have you gone? You are a sweaty mess". I should have showed her the road ID I wear and asked if she had a cell phone for when I stroked out :-). The rest of the day I was a bit sore (ok really sore after sitting for a bit) but overall didn't feel too bad so I did the normal lunch date, nap and a cookout. I love roasting garlic then eating an entire head of it on bread. I cut the bottom off, add some olive oil, salt and pepper then wrap in foil and roast on indirect heat for 45 minutes to an hour. 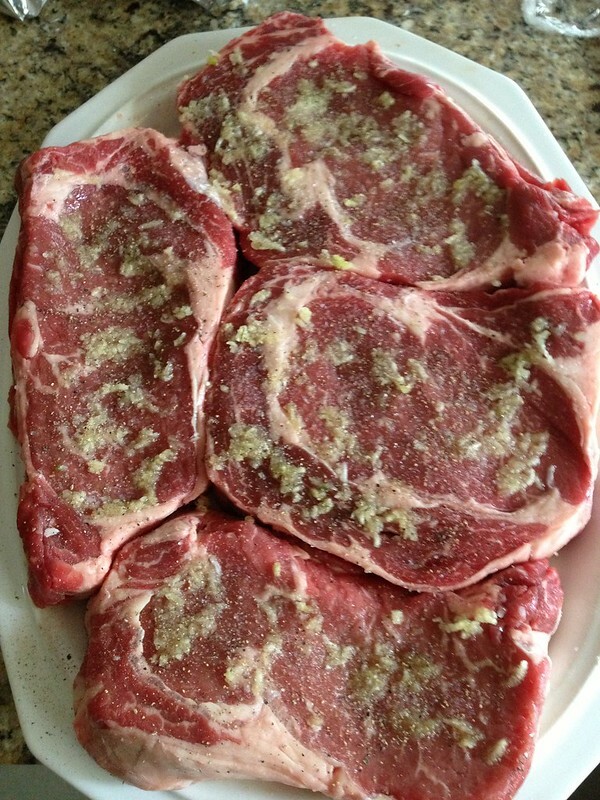 For the rib eyes, I put salt, pepper and fresh minced garlic. 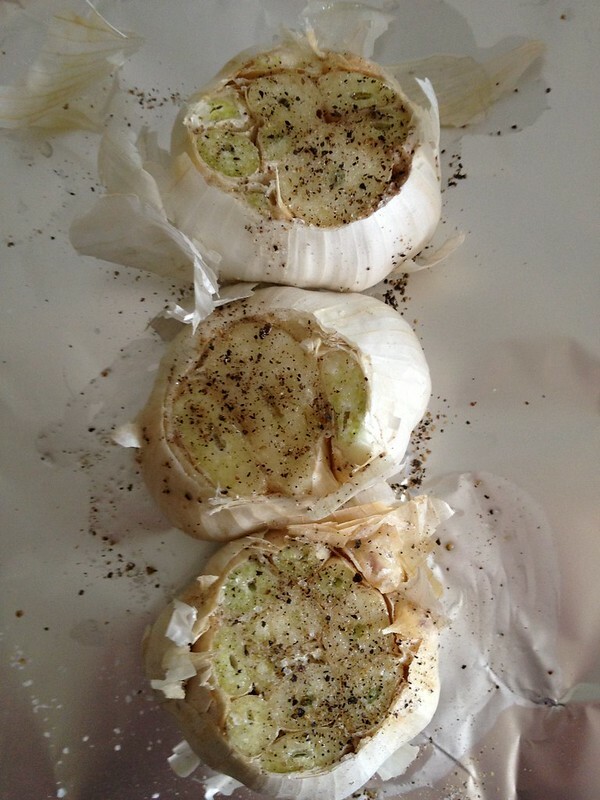 Yep, I love my garlic. Rib eyes prepped for grilling. 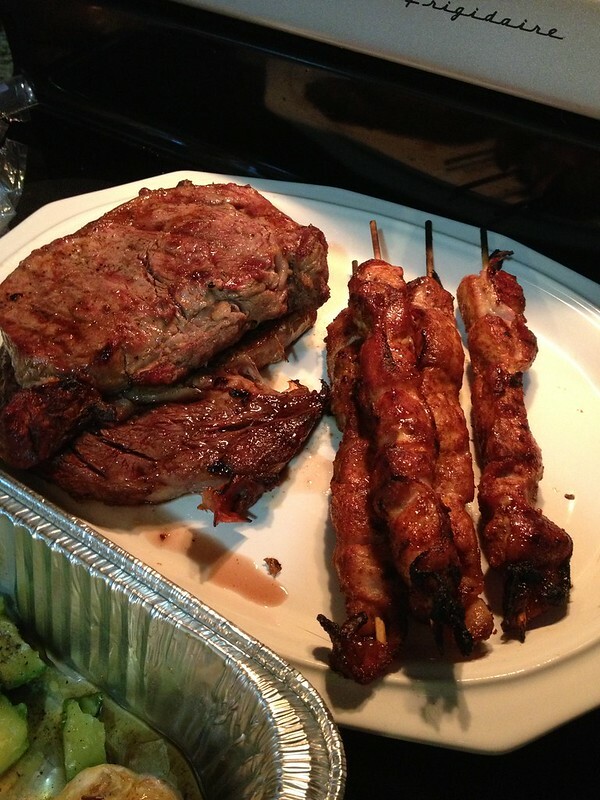 Grilled half the steaks for a neighbor and some additional pork kabobs for us. 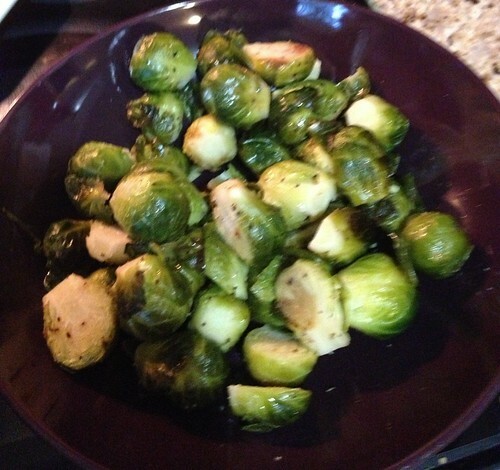 Also grilled some Brussels spouts in foil. Writing this post is making me hungry :-). There is a reason why God invented treadmills plopped in air conditioned basements (mine!). (though, us here in Colorado have been mighty uptight about all the rain we've had this summer and thus the humidity has risen to a staggering 24% - eeks!!!). Well, if Chicago has one of their steamy years, you'll be ready! And now I'm going to crawl under my covers (because it's 58 degrees right now in Denver) and listen to my stomach growl after seeing all those awesome food pics. I can 100% feel you on the humidity. It has just been ridiculous. I've found the only way to get through long runs in the summer is to be out the door no later than 6, and you are better off if you can do it by 5. Once that sun comes up it gets brutal fast. Great job still getting some great mileage in and making good calls!! Thank you for being smart enough to call that run the other day so we do not have to read about anything unfortunate happening. Your grill looks delicious also! I am drooling! These food pictures are not even fair! Good job on getting your runs in. The heat right now is just ridiculous. I was supposed to go on a group run on Monday, but it got cancelled because the feels like temp was 107*! Eff that! Too hot to run! Good for what you are getting done. I waited until evening last night to run. 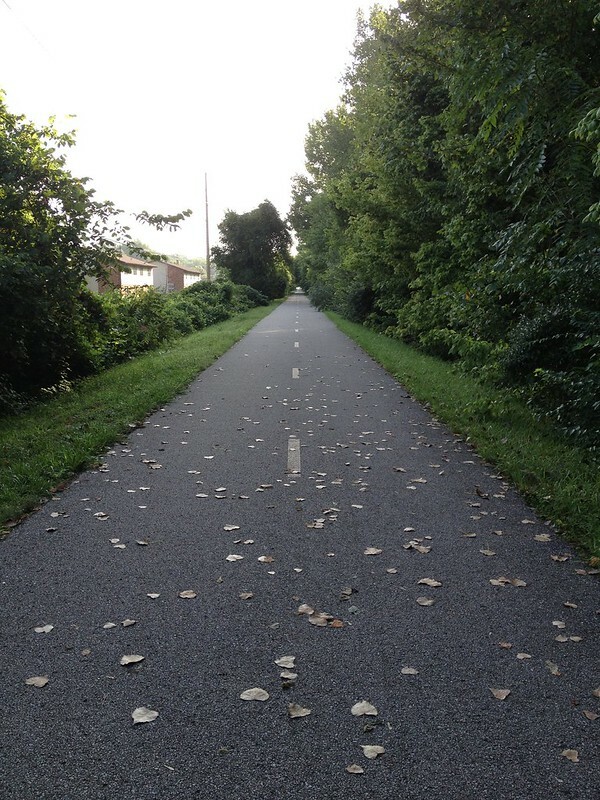 I biked in the morning which is more doable with the breeze you create. But we aren't having the heat you are. Blech it's been a tough summer for training for sure. I'm hoping it'll cool down a bit before I have to bust out the 20's for NYC. I'm thinking ribs on the grill this weekend...in fact I just bought some.